Not afraid of busy wallpaper? Want something that is uncommonly beautiful and limited edition? Check out Pattern Tales. The Topo pattern (colorway AZUL shown below) was designed by Spanish artist Ana Montiel. 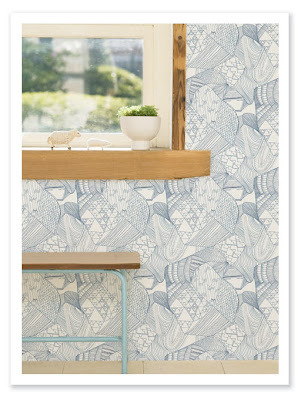 This wallpaper is eco-friendly, too, printed on non-woven paper directly from sustainable sources in Finland. Can it get any more perfect?